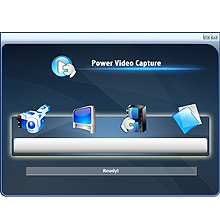 Power Video Capture is a real-time capture application. You can record any part of activities and movements and capture video and image from DV, TV Tuner or other devices like USB Cam. You can choose the video Codec Type (such as AVI and ASF). You can also start, pause, and stop screen recording with hotkeys and use Freeze Screen Video Capture to create screen demos, training videos, animated tutorials, animated presentations etc. ...... It's easy to use and the icons are designed lovely and easy to understand. Power Video Capture allows you to capture video and image from TV Tuner, DV, USB Cam, and any analog source device. With the intuitive interface and design, users can easily handle the software without any help. The video and image can be captured in a breeze! Qweas is providing links to Power Video Capture 6.0.0.165 as a courtesy, and makes no representations regarding Power Video Capture or any other applications or any information related thereto. Any questions, complaints or claims regarding this application Power Video Capture 6.0.0.165 must be directed to the appropriate software vendor. You may click the publisher link of Power Video Capture on the top of this page to get more details about the vendor.